Deep River welcomes back the South Shore Brass Band for an afternoon of music and baseball. The concert will start at noon at the gazebo. The 10-piece chamber assemble will play music perfectly play music perfectly paired with vintage baseball. 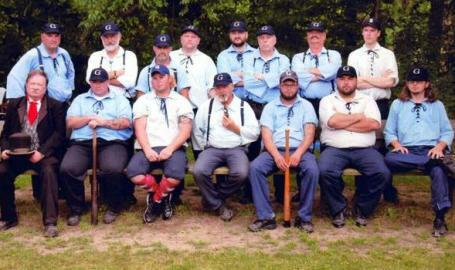 The concert will end just in time for the Grinders and the Clodbusters from Dayton, Ohio to play baseball using the original 37 rule of 1858. As always Grinders games are free! So bring chairs or blankets and enjoy a perfect Sunday in the park.